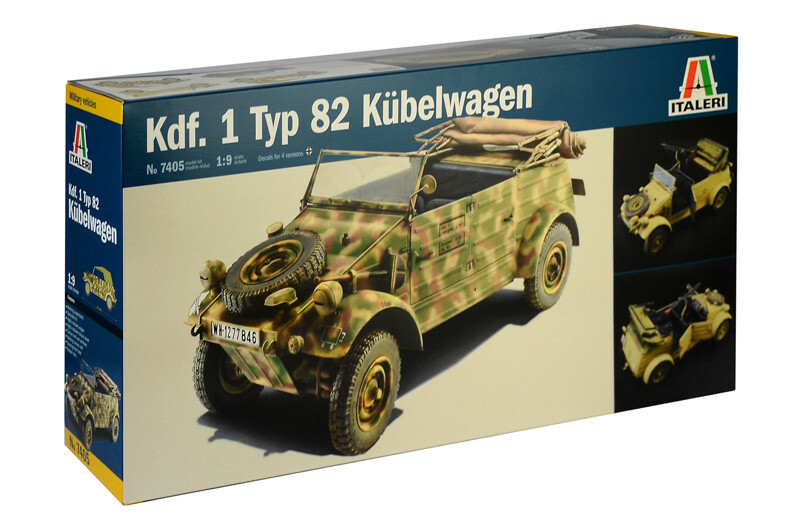 Type 82 Kubelwagen is one of the most famous military cars of the Second World War. It was designed by the engineer Ferdinand Porsche and produced by the German manufacturer Volkswagen. The project was born to have a simple vehicle, easy to build and easy to maintain and repair. The overall vehicle design is without bends and the bodywork plates are flat. Great simplicity even in the layout of the frame : just a central tube and the back support for the engine and the gearbox. The Kubelwagen, thanks to its petrol engine with a displacement of 998 cm3, was able to reach the max speed of 80 Km/h. The vehicle did not have 4x4 traction but it was extremely reliable on all types of terrain and it was present on all fronts, often in very tough environmental conditions, where the German Army fought during the entire World War II. The Kubelwagen could be armed with a support for a MG34 or MG42 machine gun.